Holy cow! I miss you guys! We're still under that same pile of work but I definitely see some light at the end of the tunnel and I'll be posting a bunch of great eye candy shortly...some projects, some amazing art from friends, and jeeez! I gotta show you the rest of the amazing Bits and Pieces collages I received and the EIGHT that I sent out ! I wish I took a pic of the priority boxes stacked 8 high on the post office counter...I mean, we always go there with a stack of 8 to 15 boxes but the fact that my giant stack this time was all for ONE swap made it sorta outta hand! Well, I have to get back to business and I promise a weighty post real soon. I'm so happy to see such an outpouring of bids and goodwill at the Angels for Brianna auction. If you have not taken part yet, there's still time to give your love and support and actually get to take home an exclusive piece of artwork from one of your favorite artists...the list of participants is long and there are some big names...ie: Nicol Sayre, Wendy Addison, and Christine Crocker just to name a few ! I really love when small communities rally for a cause with heart! Hi Jenny! 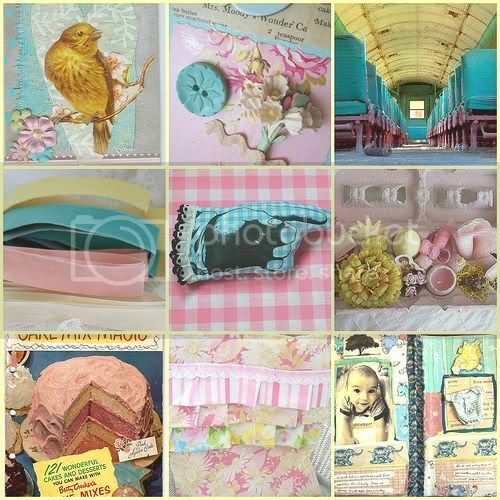 My journal page from Noah's book looks so lovely surrounded by all the other pink, turquoise and yellow- yum! Thanks for including it in your montage, and thanks also for your nice comments on my blog! I've been hearing/reading your name a lot lately- I've put you on my list of blog favorites on my computer, so I'll be checking back! The Pink, Aqua, and sunny yellow palette is so pretty. I love it. I enjoy reading your blog and always look forward to new entries. The thought of you standing at the counter of the post office totally hidden behind a wall of boxes cracked me up. I hope you and Aaron are well. I love your swaps. I've been visiting many of the lucky recipients! In case I didn't tell you, thanks for hosting the swap! It was lots of fun. Love the flickr collage! Don't work too hard!